November 2016 Libra Horoscope forecasts that home and emotional issues will rule over career and outer ambitions. You should concentrate on resolving problems on the home front and seek mental equilibrium. Career will be essential but will have to wait. In November 2016, the Librans have to decide the way and act suitably. There is no need to depend on others and you can assert yourself. You will get the support of the whole world once you make your intentions clear. The Libra zodiac sign will have the support of both Jupiter and Venus this month which will be beneficial in all ways. This is a month for indulging in sexual pleasures and enjoyment. You will look attractive with fashionable clothing and accessories. Travel for pleasure is indicated for the Librans in November 2016. You will splurge on personal luxuries. The Libra monthly November 2016 astrology predictions suggest that you will be looking for new opportunities outside your present job to increase your earnings. You may change your job or start a new business to achieve your objective. The monetary situation for the people of the Scales sign is excellent with more than forty per cent of the planets in your House of Money this month. The Libran financial intelligence will be good in November 2016. You should convert your ideas into reality this month. Money comes from sales and marketing activities. Social connections will assist the October born people in their monetary projects. Money can be made through academic interests. Investment in government securities, precious metals and transport will be profitable for the Librans in November 2016. Finances can be boosted by overseas ventures or expanding your business activities through new partnerships. Speculative investments will be profitable and earning money will be easier this month. You can expect to get money from unexpected sources towards the end of the month. The Libra 2016 November monthly forecasts predict that love is splendid this month. Committed relationships may culminate in marriages. Existing relationships will flourish and your love mate will go all out to make you sexually happy. Libra in love will have the encouragement of their lover in monetary affairs. Pregnancy related news will be awaited. Single Librans will be chased by love in November 2016. Romance is found while you are following your financial objectives. Chasing money will strain family relationships and you should maintain a fine balance between work and relationships. If you think you are in a bad relationship, quit right away! 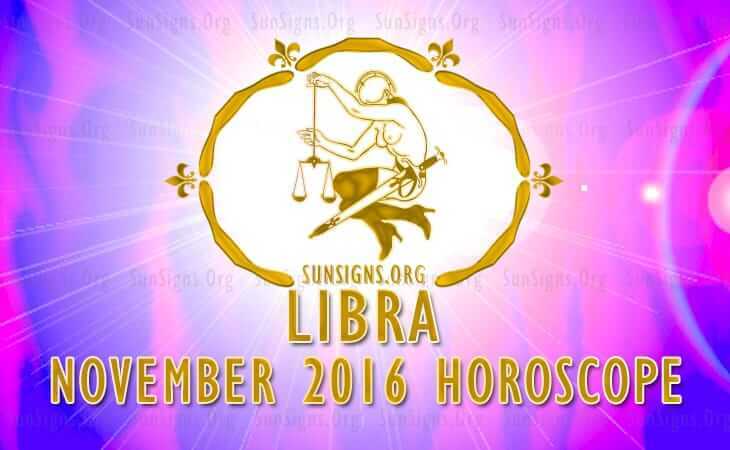 The Libra health will be quite good in November 2016. You should restrict your indulgence for junk food to stay fit. This is necessary to avoid risk of heart attack or a brain stroke. Overall, the November 2016 horoscope for the Libra star sign asks you to be mentally and physically fit before trying to solve the issues of the whole world.